English: Sonntag depicted idealized views of nature not yet affected by human development. 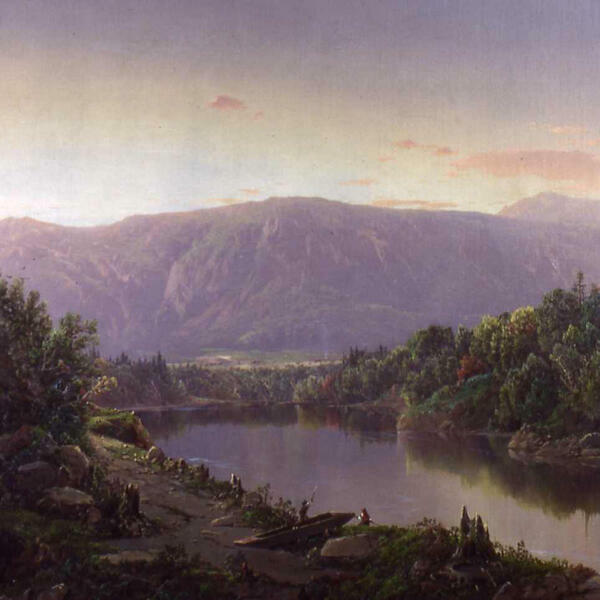 This work dates from early in his career, when he was exploring the Potomac and Ohio Rivers for subjects. Sonntag began his career as a traveling landscape painter working in the Midwest. In 1846, after receiving a contract from the Baltimore and Ohio Railroad to record the landscapes along the rail routes, he began to enjoy a growing clientele. With the proceeds from his sales, he traveled abroad, visiting Italy in 1853 and again in 1855. In Sonntag's later works, the rendering of light and atmosphere becomes subtler, reflecting an awareness of trends in contemporary European painting. Exhibition history The Walters' American Collection. The Walters Art Museum, Baltimore. 2005-2006.